'Someplace Special' to Play, Shop, Dine, Stay... The City of Mount Dora truly is 'Someplace Special,' a charming, one-hundred plus-year-old historic village in the heart of Central Florida on the shores of beautiful Lake Dora in the Harris Chain of Lakes. Join us for one of our nationally known annual festivals, go fishing in the "Bass Capital of the World," or simply relax and escape the hustle and bustle of everyday life. Bring the entire family and enjoy an old-fashioned, small-town celebration. Visit Historic Downtown Eustis Fl and its entertainment district. Eustis is filled with great shops in restaurants located within an easy walking distance from the trains loading and unloading area in Farren Park. Visit the Eustis Lake Walk and enjoy the breathtaking views over Lake Eustis. Welcome to America's Seaplane City and home-base of the Orlando & Northwestern Railway at Tavares Union Station located at 305 E. Ruby St. 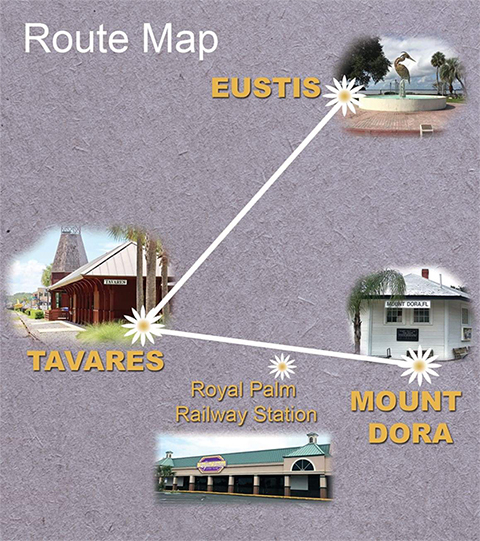 The downtown entertainment district is within easy walking distance of the train station making Tavares a fabulous destination during your ride on The Golden Triangle Route.